Clearance! 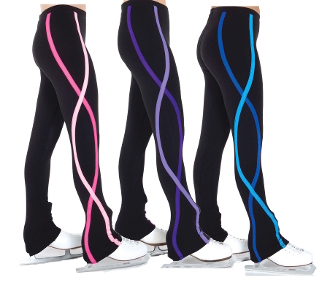 Jerrys S130 Fleece Ribbon Ice Skating Pants. Black fleece legging pants with an elastic waist. The hourglass design in complementary accent colors along each leg gives a long, slim look. Choose from Youth S - Adult L. Click on images to see color choices. Fits true to street clothing size. These are clearance pants. Brand new but too many in stock. All sales are final, no refunds or exchanges.